The name of the Hotel du Dragon is linked to the Drachenfels family who acquired the property in 1466 – a title which, in German, literally means ‘cliff of the dragon’. It should be noted, however, that the first mention of the hotel is to be found more than a century earlier when it was known as Hotel Endingen. 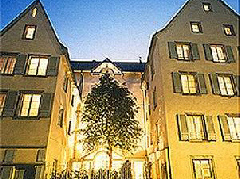 By 1418, though, the building had become the residence of the Emperor Sigismond. It isn’t until the late seventeenth century, however, that we find the hotel linked to a household historic name. Arriving in late October 1681, Louis XIV stayed for several days at the Hotel du Dragon while inspecting his new territories. 3-star rated, it offers 32 guest rooms in all.